Philips Sonicare is one of the most widely used toothbrush brands on the market today. 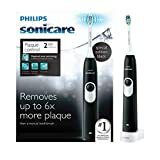 In fact, its 2 Series Plaque Control toothbrush rivals similar products, even within its own brand, removing up to 7X more plaque than manual toothbrushes (view on Amazon). Because of the range of dental products on the market, it can seem daunting to choose a long term toothbrush option. It is worth noting that 2 Series Plaque Control is designed for those who are new to electric toothbrushes and includes an EasyStart program to help users adjust. While electric toothbrushes can seem complex, it is worth bearing in mind that some features are more important than others and knowing what makes an effective toothbrush can save you time and money. With this in mind, this Philips Sonicare 2 Series Plaque Control review is here to help. Firstly, how does Philips Sonicare 2 Series Plaque Control work? So: what’s in the box? So: how does Sonicare 2 Series Plaque Control compare? Who is Sonicare 2 Series Plaque Control suitable for? Removes 7X more plaque than a manual brush. Up to 31000 brush movement/min. Up to 2 weeks brushing time. The simple one button function makes Sonicare 2 Series Plaque Control easy to use. Sonicare technology uses ultra-fast brush movements of up to 31000 strokes per minute. Because of this, it can reach difficult areas and drive toothpaste between teeth for a more effective clean. 2 Series Plaque Control also includes a sculpted brush head to help reach problem areas. Along with this, Sonicare patented technology has earned it credibility over other brands like Oral B in providing a more powerful clean. Besides that, its battery charge also lasts for 2 weeks, making it more eco friendly than other brands. Sonicare 2 Series Plaque Control rechargeable toothbrush. In addition, Sonicare offers a hard case designed for the 2 Series Plaque Control, along with replaceable brush heads. 2 weeks’ battery life (longer than other brands). 31000 strokes per minute, meaning a more thorough clean. Smartimer to help you meet the suggested brushing time. Removes 7X more plaque than manual toothbrushes. Also comes with a travel charger. Only comes with 1 refill. More costly than other brushes. Less brush strokes than other options. Like many Sonicare products, 2 Series Plaque Control comes with 1 ProResults Plaque Control brush head. Sonicare recommends changing the brush head at least every 3 months and snap-on brush heads are widely available for use with all Sonicare models. In addition, the bristles fade to white when it is time to replace the brush head. Sonicare Series 2 also includes a Smartimer—a device that tracks the recommended 2 minutes of cleaning time. The ADA notes that most Americans brush for only 45 seconds, which can lead to dental problems. With this in mind, the Smartimer helps you to maintain a healthy oral hygiene routine. Because of 2 Series Plaque Control’s 2-week battery life, you can brush for up to 14 days without charging. While this is lower than the 3-week maximum, it is significantly higher than other electric toothbrushes, such as Oral B, which lasts for 7 days on average. Also, Philips has a Green Logo, meaning it aims to reduce energy consumption and costs by focusing on eco efficiency. With its EasyStart program, Sonicare Series 2 increases the brush’s speed over 14 uses. Unlike other electric toothbrushes, this makes it a seamless transition for those used to manual brushes and helps you adjust to the Sonicare experience. 2 Series Plaque Control has a brush stroke of 31000 per minute, which is what makes it a sonic toothbrush. This is in contrast to other electric toothbrushes like PowerUp, which typically only have around 15000 strokes per minute. With this in mind, the brush can target hard to reach areas with less effort and time. This also makes for a powerful yet gentle clean that minimizes the risk of tooth damage. It is worth noting that Sonicare 2 Series Plaque Control comes with a travel charger for on the go as well as at home use. Because it’s portable, this ensures your brush’s efficiency whenever you need it. Rather than using complex modes, 2 Series Plaque Control includes one brushing mode which effectively cleans the teeth and gum line. Along with the EasyStart program, 2 Series Plaque Control is a more comfortable transition from manual to electric. The listed Sonicare products all include 1 refill brush head, a Smartimer, and an EasyStart program. They also include one cleaning mode for ease of use. While Easy Clean is a more costly option, it includes the same 2-week battery life. First of all, 2 Series Plaque Control is most suitable for those new to electric toothbrushes. This is because it includes an EasyStart feature to gradually increase speed over 14 uses. It is also good for those looking for a mid-range price and a no-frills design. However, it is less suitable for those on low budgets. With this in mind, Sonicare Essence+ is a cheaper alternative. Similarly, If you have sensitive gums, a toothbrush with intensity options could be more useful. Notably, Sonicare DiamondClean includes a gum care brushing mode as well as a sensitive mode. While the immediate battery life of the 2 Series Plaque Control is very good, the extended battery life is less so, with products lasting around 1-2 years. However, despite the relatively short life span of the device, many people still opt to use it as Sonicare is a trusted brand, renowned for achieving great results. To increase the product’s reliability, correct use is important. Because of this, Sonicare suggests charging the toothbrush for 24 hours before your first use and to avoid keeping the toothbrush on charge at all times. First of all, apply a pea sized amount of toothpaste onto the brush head. Wet the toothbrush with cold water. Angle the brush towards your gums and press the ‘on’ button. Glide slowly across your teeth and gum line. Sonicare 2 Series Plaque Control has largely positive reviews and most buyers found the brand’s information accurate and helpful. Overall, Sonicare 2 Series Plaque Control is a good option for everyday use. 2 Series Plaque Control is a mid-range price when compared to the rest of the Sonicare range. Because of its EasyStart feature and one-clean brush mode, it is also hassle free and easy to use. How do you activate ‘Easy Start’ mode? For easy use, you can activate 2 Series Plaque Control’s ‘Easy Start’ mode by pressing the on/off button until you hear a beep. After this, the intensity will then increase over 14 uses. How do I charge this toothbrush? For ease of use, Sonicare 2 Series Plaque Control comes with a travel charger base. With this, you can charge the internal battery by attaching it to the charger base. Do any Sonicare brush heads fit this model or do I need a specific one? Sonicare’s snap-on brushes are designed to fit all Sonicare models, so you don’t need a specific brush head. How does the Smartimer work? The Smartimer works by timing the brushing duration after the button is activated. Also, the Smartimer runs in 30 second intervals. This signals when it is time to move to a new quadrant of the mouth. Can I use this if I have sensitive teeth? It is worth noting that this brush is one of the range’s ‘standard’ toothbrushes. Because of this, it is designed for everyday users rather than those with extreme dental issues. While the one-clean brush mode is suited to gentle cleaning, Sonicare DiamondClean includes an option for those with sensitive teeth. How long can I use each brush head for? The recommended brush head replacement is every 3 months. Like most Sonicare products, the 2 Series bristles fade to white when it is time to replace the brush head. Do I need to hold the button down to keep it on? No; pressing the button once will activate the toothbrush (and the Smartimer). After 2 minutes, the brush will turn off. Like most Sonicare products, 2 Series Plaque Control has a 2-year warranty. Can I use this toothbrush if I have gum recession? While Sonicare offers toothbrushes like DiamondClean which includes gum care modes, Philips recommends contacting them directly or consulting your dentist for further advice. Will this toothbrush damage braces? Although Sonicare 2 Series Plaque Control is gentle on teeth and gums, its power does increase over the initial 14-use period. Because of this, Philips recommends speaking to your dentist before purchasing. 0.8 x 0.8 x 8 inches.